Innovation leaders promote and address the innovation agenda in their company. Through personal conviction or competitive necessity they are obsessed with providing superior value to customers through innovation. They know how to mobilize their staff behind concrete innovation initiatives and do not hesitate to personally coach innovation teams. For innovation to occur leadership has to be collective. To create a momentum for innovation in their company, leaders from different functions need to team up, to build innovation networks. Innovation leadership is not just an innate talent that can be selected at the hiring level. It can be developed within an appropriate company culture through careful leadership development, typically achieved through career management and coaching. Innovation leaders also need to stay on board and it is the responsibility of the top management team to create an attractive climate to develop and keep its innovation leaders. 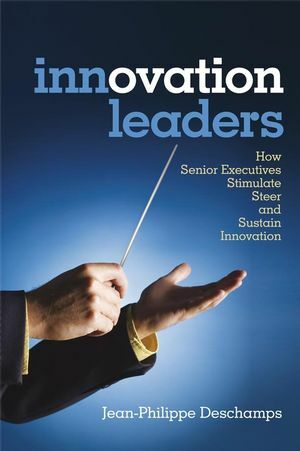 There are plenty of books that deal with innovation, or with new product development, or with leadership; this is different in its focus on the specifics of innovation leadership – that particular form of leadership that stimulates and sustains innovation. This book maps the broad territory of innovation leadership and contributes new thinking on the focus of the emerging leadership role of the CTO; distinction between ‘front end’ and ‘back end’ innovation leaders; the concept of aligning leadership styles with strategy; and the chain of leadership concept. Combining practice-based and empirical research-based observations with simple conceptual frameworks, illustrated by many company examples and case stories from a broad range of industries in the US and Europe, this is a systematic presentation of innovation drivers and their implications in terms of what leaders need to do to make it work. Jean-Philippe Deschamps is an innovation management practitioner with 40 years of international consulting experience. At IMD, which he joined in 1996 as professor of technology and innovation management, he focuses his research, consulting and teaching on the role of leaders in innovation. Before IMD, he was a vice president and practice leader with consulting firm Arthur D. Little. He co-authored the best-selling book Product Juggernauts: How Companies Generate Streams of Market Winners (Harvard Business School Press) and has given seminars and lectures throughout the world, including twice at the World Economic Forum in Davos. He graduated from HEC, INSEAD and Harvard Business School. 1. A Special Form of Leadership for Innovation? Innovation Leaders: A Different Breed? 2. What’s Special about Innovation Leaders? Logitech: Ordinary or Extraordinary Company?